Each time you create an email campaign, you may wonder whether your content is presented in the best way. Use an A/B testing campaign to test how small changes to your campaigns impact your results. In this article, you'll learn how to create and edit A/B testing campaigns. Be sure you're familiar with how A/B testing campaigns work. We recommend you send combinations to at least 5,000 subscribed contacts to get the most useful data from your test. If the size of your audience or segment doesn't allow for 5,000 subscribers in each combination, consider testing your entire audience and use the campaign results to inform future campaign content decisions. Subscribers may not interact with your campaign right away, so test data may take some time to populate. We recommend you wait at least four hours after you send an A/B testing campaign to send the winning campaign. Winner notification emails are sent to any user on your account with a user level of Manager or higher. When you test content as the variable in an A/B testing campaign, choose the winner by click rate, as opposed to open rate, since opens occur before a subscriber views your content. If you change your mind during the test phase, you can convert to manual selection to choose the winner from the campaign report. A/B testing campaigns are built in a series of steps, just like other campaign types. If you haven't started building an A/B testing campaign yet, start at the beginning of these instructions. If you already started and saved your progress, skip to the step you want to work on. To create a new A/B testing campaign, follow these steps. In the pop-up modal, click Email. On the first step of the Campaign Builder, choose the audience or segment you want to send your campaign to. To send to a segment, configure a new segment on this screen, or choose a saved segment. To choose the elements you want to test, follow these steps. On the Variables step, click the Plus icon for the variable you want to test. Click the Plus or Minus icons to add or remove variations of the variable. You can test one variable with up to three variations. Each variation will generate a campaign combination as shown in the Summary. 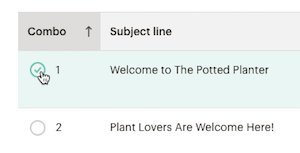 For example, to test three subject lines, we'll create three combinations of your campaign. Under How should we split your recipients?, click and drag the slider to set the percentage of your recipients you want to send your test combinations to. Review the number of recipients that will receive each combination in the Summary. If you're testing Send time, you'll always send to 100% of the subscribed contacts in your chosen audience or segment. Choose whether to determine a winner based on open rate, click rate, total revenue, or manually. Then, choose how long you want the test to run. At the end of the test phase, we'll send the winning combination to your remaining recipients. 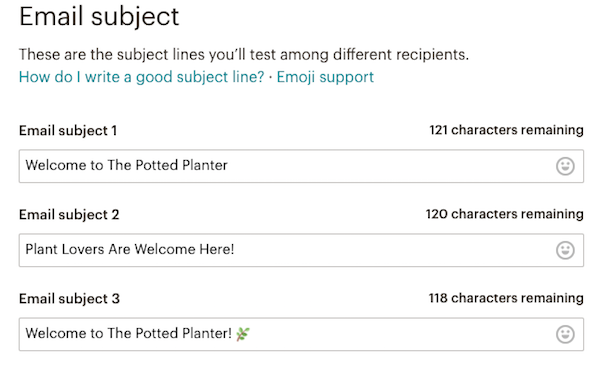 Depending on which variable you test, the Setup step will present multiple Email subject, From email address and name, and Subject line fields. Type in your variation content in the field provided. Send time variations settings also appear on this step. Check the boxes next to your preferred settings or tracking options to include. Track opens and Track clicks can't be disabled, since they're used to determine the winner of the test. The Content step is where you add content for your campaign. What you see on this step will vary if you choose to test content. 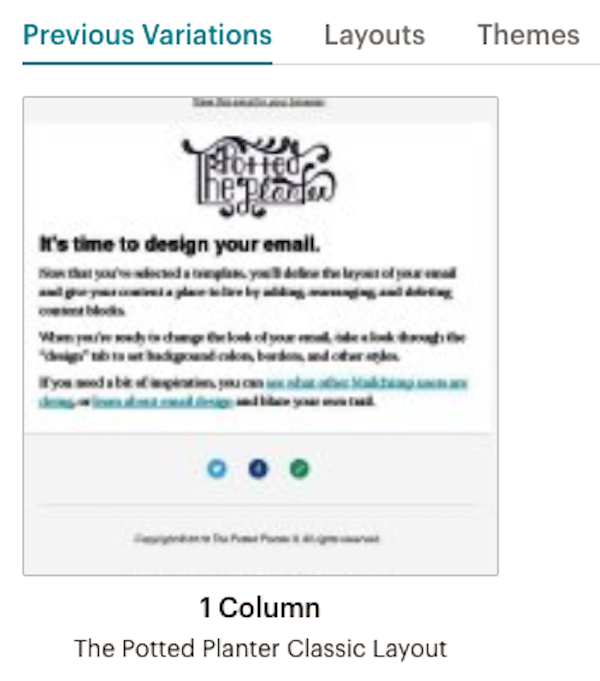 Choose your layout on the Template step of the Content Builder. On the Design step of the Content Builder, design and test your campaign. When everything is how you want, click Confirm before sending. 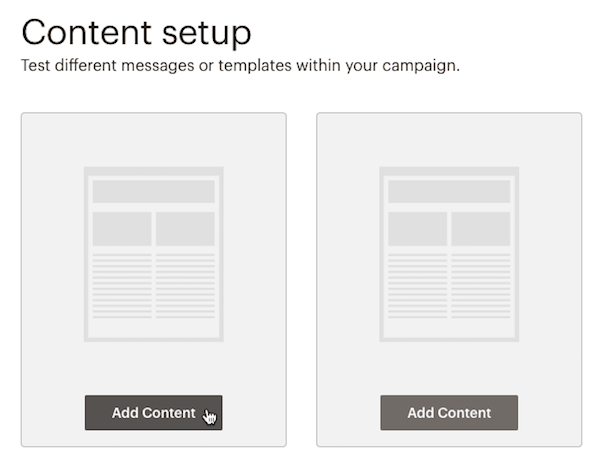 The Content setup page shows a preview for each variation of your campaign content. To add content to each variation, follow these steps. Click Add Content for a variation of your campaign. On the Design step of the Content Builder, design and test your campaign. When everything is how you want, click Next. On the Description step of the Content Builder, type in text to describe the variation of the content. Your subscribers won't see this description, but it will help you remember the differences between each variation. Click Continue to content to return to your content variations. Repeat steps 1-5 for each content variation. On the Template step, use a different template or select a variation you already designed in the Previous Variations tab. When everything is how you want, click Next. The Confirm step is where you'll review the combinations that make up your A/B testing campaign. Review the Pre-Delivery Checklist. Click Resolve or Edit to make changes to any section of the campaign. After you're finished, Send your campaign now or Schedule it to go out later. Account users with a Manager user level or higher will receive an email when a winner has been automatically chosen, or after four hours if you haven't yet picked a winner manually. If a subscriber opens the campaign in their browser, they'll always see the campaign combination they received, even if the winning combination is different. The winning combination of your A/B test will appear in the public campaign archive for your audience, unless you tested send time. If you chose Manual Selection from the drop-down menu on the Variables step of the Campaign Builder, you'll be able to view the campaign report after tests are sent, and choose a winner. To manually choose a winner, follow these steps. Click View report for the A/B testing campaign you want to work with. An alert will tell you how long into the testing phase you are and recommend that you wait at least four hours. Review the report for each combination. 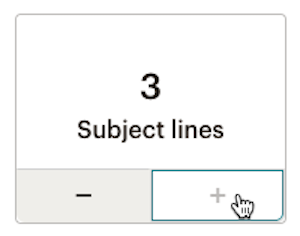 Under Finalize your test, click the radio button next to the combination you want to send to your remaining subscribers. Click Send To Remaining Recipients. Click Send Now in the confirmation pop-up modal to send the winning campaign. After you send your test with the choice to have the winner chosen by open rate, click rate, or total revenue, you may decide that you want to manually choose the winning combination instead. To convert to manual selection after you sent your campaign, follow these steps. Click Convert to manual selection. In the pop-up modal, type CONVERT in all caps and click Convert. When you're ready, choose a combination to immediately send to your remaining subscribers. In the event that none of your recipients opens or clicks in any of your combinations, the final set of recipients will get the last combination by default. This could happen if your test sends to very few recipients. If the same number of people click and open your combinations, the first combination will send to the remaining recipients. Use Mailchimp's A/B Testing Campaigns to test how different factors affect your email engagement. Learn what you can test and how winners are chosen.